Acoustic echo path delays (a.k.a. impulse responses of acoustic echo paths) are rarely static. Depending on the acoustic scene they may vary fast and thus even advanced adaptive filters may have difficulties to track echo path changes. In acoustic echo paths, we can typically identify two regions: early reflections (which often are distinguishable and of greater energy) and late reflections (which are of smaller energy and are hardly distinguishable. 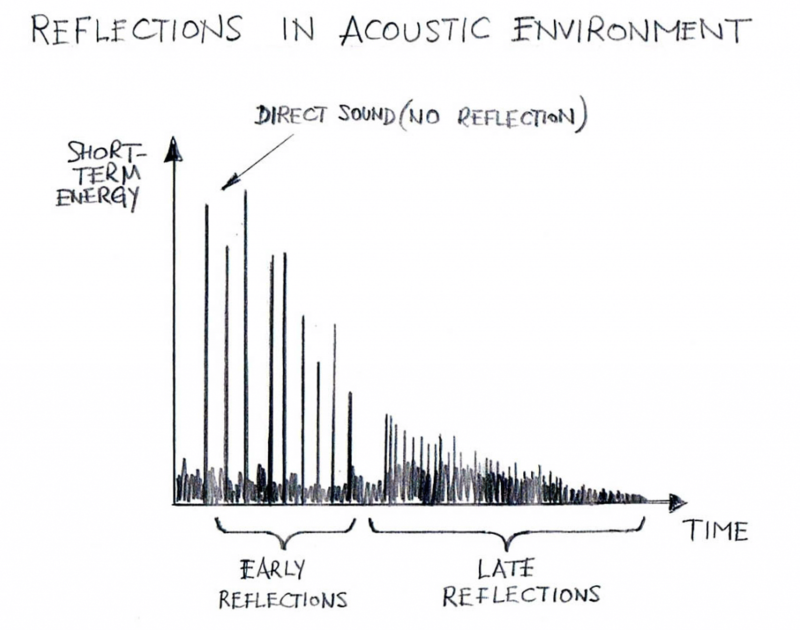 In some acoustic environments (Figure 1), partition of the entire echo path onto early-reflection and late-reflection regions is not apparent. Figure 2 illustrates one example of such a case. Acoustic Echo Cancellers are typically designed to cope with early reflections while late reflections are left uncancelled by the adaptive filter. The acoustic echo canceller’s Non-linear Processor is typically able to efficiently attenuate residual echoes associated with late reflections. However, adequate removal of late reflections (i.e., reverberation effects) can be addressed by dedicated de-reverberation DSP solutions that typically are not included in acoustic echo canceller functionality. A somewhat separate challenge for the Acoustic Echo Canceller is to remove traces of echoes or related artifacts that are attributed to non-linear distortions produced by loudspeakers. Most often the adaptive filter of Acoustic Echo Cancellers is, by design, a linear filter. Therefore it is not capable of identifying non-linear echo path. Now let us assume that there are no substantial signal delays (introduced by packets/networks) that might affect audio signals travelling between Acoustic Echo Canceller ports and acoustic transducers (i.e., loudspeaker and microphone). Also, suppose that an Acoustic Echo Canceller under consideration is exposed only to acoustical coupling between the loudspeaker and the microphone (as it happens in the case of “close talk” when using a cell phone). Then, under these assumptions, the acoustic echo path delay is relatively small. In most of the practical cases, the acoustical coupling-related part of the acoustic echo path delay does not exceed 4 milliseconds (and often it is even smaller than that). This is perhaps one of the ‘best scenarios’ for the Acoustic Echo Cancellation. Therefore, the coverage of that portion of the acoustic echo path by the adaptive filter is always ensured by typical designs where the echo path capability is in excess of 64 milliseconds. However, if there are significant acoustic signal reflections caused by the acoustical environment (typically manifested during the speaker mode of the voice terminal/telephone set), then the Acoustic Echo Canceller’s adaptive filter length (i.e. echo path capacity) needs to be appropriately greater. For example, assuming that the total acoustical path for reflected signals is 80 feet – a realistic assumption for a medium sized office that has the largest dimension of 10 feet and where there are 8 distinct acoustic reflections of practical importance – the echo path coverage by the filter has to be at least 70 milliseconds). If the voice path between ports of the Acoustic Echo Canceller and the transducers located at the near end includes additional delays (caused, for example, by packetization processing, network buffers, and other typically present factors) then the required echo path coverage is proportionally greater. Hence, it is often required that an Acoustic Echo Canceller be capable of cancelling echoes spread over 128 milliseconds. Please contact us to discuss your acoustic echo canceller application requirements.